If you like surf, sand and year-round sunshine, Jacksonville is the city for you. With job growth for electricians predicted to be faster than the national average, this Florida city can be a great place to start your career after electrician training. In Florida, the requirements for earning a journeyman or master electrician license depend on the county, but the state issues the license to become a certified electrical contractor. Step 1: High School Diploma or GED. Details: The Bureau of Labor Statistics states that a high school diploma or GED is required to become an electrician. Advantage: Studies show that earning a high school diploma increases employment opportunities and wages throughout an individual’s lifetime. Time: 3 months to 4 years. Advantage: Learning the trade through technical training can give you a competitive advantage over other apprenticeship and entry-level job applicants. Many trade schools set up internships or other opportunities for students to meet local employers, giving them a leg up in the job market. In Jacksonville, some vocational certificates can count toward the work experience required to become a journeyman electrician. Time: 7 months to 2 years. Details: Continue learning important electrical principles while practicing the trade through an apprentice or contractor-supervised training program. You can find apprenticeships through union and contractor associations. Check with local contractors to see if they offer on-the-job training. Advantage: Gaining experience in the field through an apprenticeship or entry-level electrician job is necessary to become a journeyman electrician. Time: 4 years in Jacksonville. Details: The Construction Trades Qualifying Board issues the journeyman electrician license in Jacksonville. You’ll need to submit the application and proof of 4 years of work experience 30 days prior to 1 of the 4 annual exam dates. Check the office of the Building Inspection Division for those dates. Fees for the application, exam and certificate can be found on the website of the Construction Trades Qualifying Board. Take the exam to get your journeyman electrician license. The multiple-choice test covers the National Electrical Code, the Jacksonville Building code and other electrical rules and principles. You’ll also be required to demonstrate your ability to perform electrical work in a safe and competent manner. Answer 75 percent of the questions correctly and you pass! Advantage: This license allows you to work unsupervised under a master electrician, installing electrical fixtures and outlets and troubleshooting problems. Time: You’ll need 4 years of work experience to be eligible for this license. Check with the board for more information on how long the application, testing and licensing process can take. Details: The Construction Trades Qualifying Board also issues the master electrician license. Unlike for the journeyman and contractor license, exams are only offered twice a year for the master electrician license. Check the board’s website for fees and the office of the Building Inspection Division for the exam schedule. Expect a much more comprehensive exam for the master electrician license. You’ll have to show your ability to plan, lay out and supervise electrical work. The test also covers the Florida laws governing the operation of a construction business, including tax and lien laws, workmen’s and unemployment compensation and general construction and business safety. Similar to the test for the journeyman license, the exam is multiple choice and requires a 75 percent passing score. Advantage: With this license comes more responsibilities: laying out installations and wiring systems in accordance with electrical codes. You can also work unsupervised. 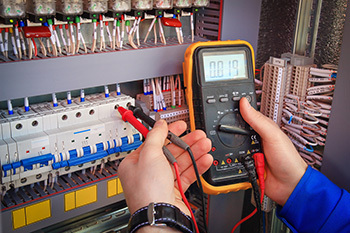 Time: Eight years of experience are necessary to become a master electrician in Jacksonville. A college degree in engineering or electrical engineering can substitute for 2 years of work experience. Two years of supervisory or lead experience can also be helpful. Details: You have two options for becoming an electrical contractor in Jacksonville. You can become a registered electrical contractor through the Construction Trades Qualifying Board, which grants you contractor responsibilities in Jacksonville. If you want to offer contracting services throughout the state, you’ll need to contact the Florida Electrical Contractor’s Licensing Board to become a certified contractor. Advantage: If you want to run your own business, you’ll need a contractor’s license. There are, however, expenses that come with starting a business. To protect your employees and customers, you’ll have to pay for general liability and property damage insurance. Time: The time it takes to complete the process of earning an electrical contractor’s license depends on the granting agency and the individual. The electrician profession in Jacksonville has plenty of room for career advancement, but if you want a steady start on this path after high school, proper electrician trading is the best, surest route. Discover more about why becoming an electrician could be a good career choice for you.